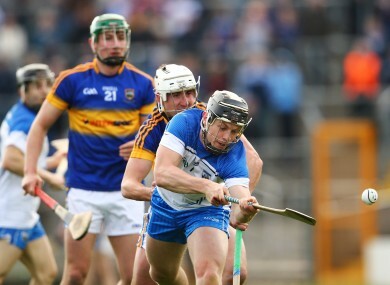 Philip Mahony is back in the Waterford hurling ranks. A CONTRAST IN twelve months, from the low of the treatment table to the high of Semple Stadium. On the Sunday of the May Bank Holiday weekend last year, Waterford’s Philip Mahony saw his 2014 inter-county dreams wrecked. A double leg fracture and dislocated ankle in a game with his club Ballygunner brought his season to a shuddering halt. Yet Mahony bounced back, accelerated his recovery and by last October he was hoisting the Waterford senior hurling trophy aloft as Ballygunner’s county-winning captain. This year has marked his inter-county return, nailing down the left half-back position on the Waterford team that moved smoothly through Division 1B to the collection of the promotion prize. Knockout wins over Galway and Tipperary have propelled them to next Sunday’s league final against Cork. Philip’s brother Pauric – the scoring heart of the Waterford side – admits it’s been quite a change in fortunes for his sibling who is a year older than him. “He’s 100%. He came back for the club at the end of the club championship last year. He then took a month off to get it right, October off after the club was over, to make sure it was 100%. He hasn’t had any problems since. Pauric turns 23 next month and revealed the differences between the Waterford hurlig brothers. “He’s certainly better at the diet part than me, Philip doesn’t put anything bad into his body! We have a table-tennis table in the house alright and it got very competitive there for a while. We had to call a halt to that fairly quick! I don’t really do PlayStation but he plays a nice bit of FIFA and would be way better than me. Email “Back from double leg fracture and dislocated ankle for Waterford's league final run”. Feedback on “Back from double leg fracture and dislocated ankle for Waterford's league final run”.